When you create a service, you can use a Visual Studio project template called Windows Service. This template automatically does much of the work for you by referencing the appropriate classes and namespaces, setting up the inheritance from the base class for services, and overriding several of the methods you're likely to want to override. The Windows Services project template is not available in the Express edition of Visual Studio. Create the necessary installers for your service application. 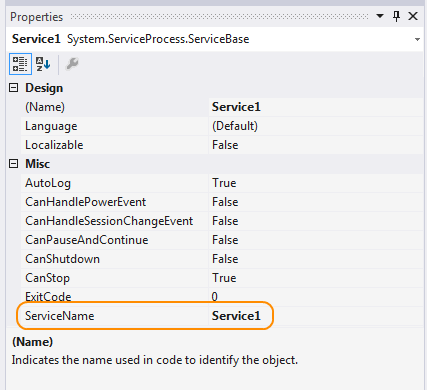 Override and specify code for the OnStart and OnStop methods to customize the ways in which your service behaves. For instructions on writing a service without using the template, see How to: Write Services Programmatically. The value of the ServiceName property must always match the name recorded in the installer classes. If you change this property, you must update the ServiceName property of installer classes as well. Set any of the following properties to determine how your service will function. CanStop True to indicate that the service will accept requests to stop running; false to prevent the service from being stopped. CanShutdown True to indicate that the service wants to receive notification when the computer on which it lives shuts down, enabling it to call the OnShutdown procedure. CanPauseAndContinue True to indicate that the service will accept requests to pause or to resume running; false to prevent the service from being paused and resumed. CanHandlePowerEvent True to indicate that the service can handle notification of changes to the computer's power status; false to prevent the service from being notified of these changes. AutoLog True to write informational entries to the Application event log when your service performs an action; false to disable this functionality. For more information, see How to: Log Information About Services. Note: By default, AutoLog is set to true. When CanStop or CanPauseAndContinue are set to false, the Service Control Manager will disable the corresponding menu options to stop, pause, or continue the service. Add the necessary installers for your service application. For more information, see How to: Add Installers to Your Service Application. Do not press F5 to run your project — you cannot run a service project in this way. Install the service. For more information, see How to: Install and Uninstall Services.